I know I said this wasn't going to be a depressing space anymore, but there are things that are obviously out of control. Earlier this week, Joan's maternal grandfather, John Robert Burton Sr. passed away. We're kinda all talked out, so here's the official write up. NEW IBERIA - Memorial services will be conducted for , 82, on Friday, January 15, 2010, at 2 p.m., at the First Assembly of God Church, with Rev. Paul Neel officiating. A gathering of family and friends will be held in the David Funeral Home Chapel on Thursday, January 14, 2010, from 5 p.m. until 8 p.m. and at the First Assembly of God Church on Friday from 11 a.m. until the services. 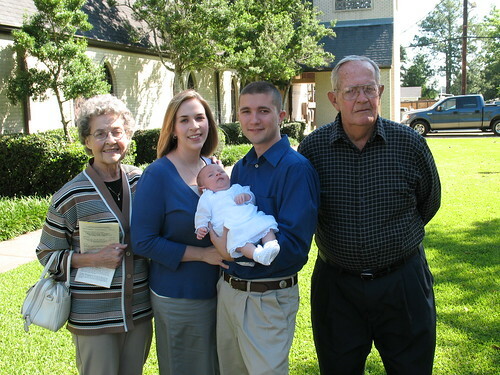 A native of Oil City, LA and a resident of Erath, LA, Mr. Burton died on Tuesday, Jan. 12, 2010 at L.S.U. M.C. in Shreveport, LA. He was a veteran of World War II having served in the U.S. Air Force and was a proud participant of the Honor Air Flight. As a descendent of Louisiana Oil Industry Pioneers, he was instrumental in research and development of various high pressure production equipment widely used within the petroleum industry today. He was a member of the American Petroleum Institute. Mr. Burton worked for the Joy Corporation in Fort Smith, AR from 1984 - 1986. Mr. Burton and his wife, Margaret were residents of Van Buren, Arkansas from 1990 to 2000. During that time they edited and published "Bind Us Together". This well received monthly Christian newspaper was recognized throughout Northwest Arkansas and Southeast Oklahoma. 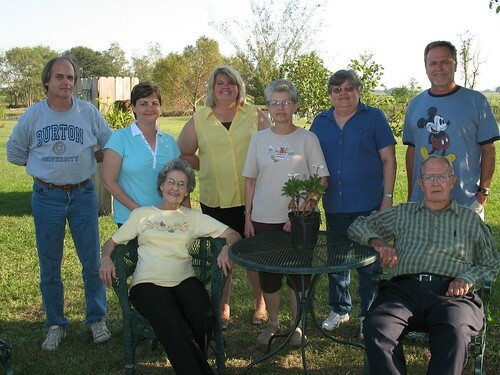 He was survived by his wife of 63 years, Iris Margaret Barnes Burton, of Erath; his sons, John Robert Burton, Jr. and his wife, Sherie, of Youngsville, and Paul Christopher Burton, of New Iberia; his daughters, Martha Evelyn "Lynn" Darby and her husband, Larry, of Lafayette, Margaret Theresa "Terry" Bates, of Pensacola, Fla., Cecilia Carolyn "Carol" Boudreaux and her husband, Danny, of Erath, and Mary Constance "Connie" Andre and her husband, Rusty, of New Iberia; his brother, Keith W. Burton, of Oil City; eleven grandchildren; and six great grandchildren. He was preceded in death by his parents, Paul H. Burton and Sallie Bamburg Burton; his daughter, Mary Anne Burton; his sisters, Joan Burton and Mary Carolyn Burton Crain and two grandchildren, Angelina and Cassie Burton. Here he is last year with all of his kids. This will hopefully be the last obit here for a loooooooooooooong time. If you hear fireworks in a couple of weeks, it will be our New Year Party as we are officially erasing January and staring over with February. First of all let me say, I am stunned, HURT, upset, and in prayer for all of you. This is Shane and Kitty, your cousin. I am heard about this for the first time tonight at 9:30 pm. I have finally composed myself. I loved him and all of you like you could never imagine. Yall are the family we always long to see at the reunions. Words cannot express what I am feeling right now. Just know that I love yall and had I known, would have been there through out the whole ordeal. You are in my prayers! Better Late than Never ? ?